Almost 70 years to the day after Enzo Ferrari test drove the first car to bare his name. 2017 is going to be a year of celebration for Ferrari. The company was founded 70 years ago and on March 12, 1947, Enzo Ferrari drove the 125 S–the first car to wear his name–through the factory gates and onto the streets of Maranello. When it was fired up for the first time on that fateful day, the 125 S was still an unbodied steel rolling chassis, with the 12-cylinder powerplant designed by Gioacchino Colombo with help from Giuseppe Busso and Luigi Bazzi, at the heart of the first Prancing Horse. A couple of months later and the 125 S had won the Rome Grand Prix, completing 40 laps and 137 km at an average speed of 55 mph, the first of six victories in 1947. Ferrari has reenacted that special event, with the first 12-cylinder car to sport the Cavallino Rampante on its hood driving out the factory on Via Abetone Inferiore being replaced by the LaFerrari Aperta. March 12 also represents the start of Ferrari’s anniversary celebrations, where over 60 nations will host special events throughout the year as part of the “Driven by Emotion” concept. 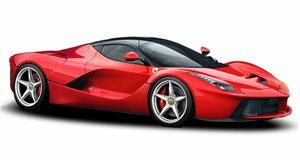 The LaFerrari Aperta will be present at each stage, symbolizing the 70th anniversary, with Australasia opening the program and Maranello hosting the finale on the weekend of September 9 and 10.